In 1972, Jacqueline Kennedy Onassis, U.S. Senator Robert Taft, Jr. and Sam Beard founded the American Institute for Public Service (AIPS) to establish a Nobel Prize for public and community service known as The Jefferson Awards. 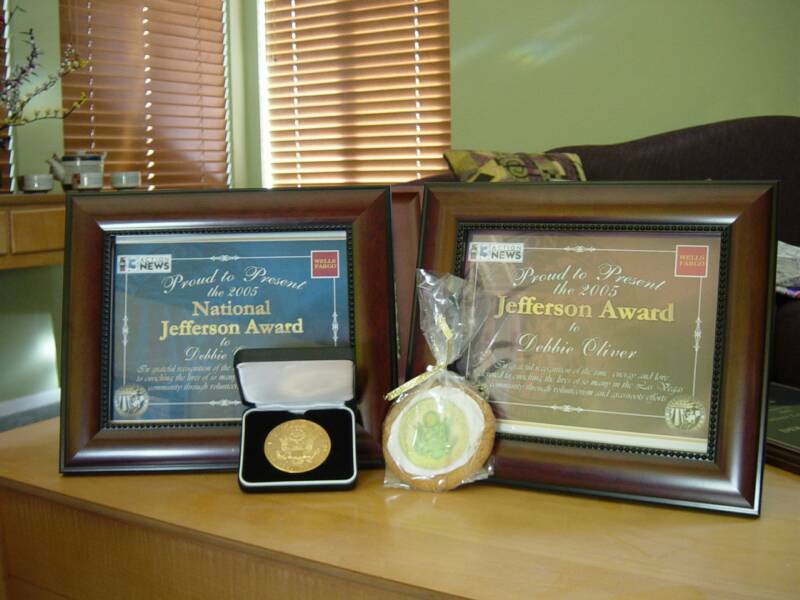 Debbie Oliver, founder of cleftAdvocate, was honored with the Jefferson Award in her hometown of Las Vegas, NV for March 2005. The organization enjoyed additional publicity when the ABC-13 Action News team covered the North American Craniofacial Family Conference (NACFC) in July, making the event a focus of her Jefferson Award news story. 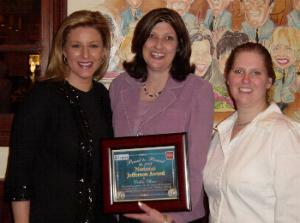 A luncheon for last year's local winners and their guests was held at The Palm Restaurant at Caesar's Palace in March 2006. During those ceremonies, Debbie was selected as the national winner for the Southern Nevada region, advancing to ceremonies slated for June 19-21, 2006 in Washington DC. The national ceremonies include three days of activities, including an official welcome dinner, a Senate Reception on Capitol Hill and a black-tie Gala, where five of the national winners will be awarded the Jacqueline Kennedy Onassis Award for "Outstanding Community Service Benefiting Local Communities." In addition to receiving the Jefferson Award, Debbie also accepted the Parent-Patient Leadership Award from the Cleft Palate Foundation in 2005, and appeared on the Montel Williams show as a winner of Charming Shoppes' Voices 2005 Campaign. Homestead...The Fastest Way to Build a Web Site! ABC-13 Action News anchor Tricia Kean with cleftAdvocate Founder Debbie Oliver and Community Affairs Director Katie Bencze at the annual Jefferson Awards luncheon in Las Vegas, NV. Local and national certificates were presented by media partner ABC-affiliate KTNV Channel 13 and corporate sponsor Wells Fargo Bank. The Jefferson Award medallion is also shown.